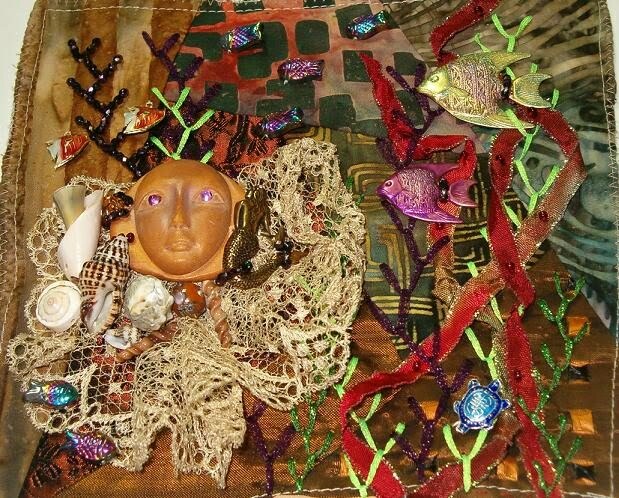 So, I thought of a sea witch as my use of her clay face. Hope she likes my interpretation of her block. Just got back from a wonderful visit with friends in Ohio. We went to bead shoppes, a wonderful thread store, and spent the day at the Columbus Convention Center viewing some GORGEOUS quilts at this year's National Quilting Association Quilt Show. Astonishing work. I took loads of pictures, but we were instructed not to post any photos of the quilts without express permission from the folks actually making them. So, I have a show brochure and will be contacting at least a couple of them..to see if I can share their creations with you. 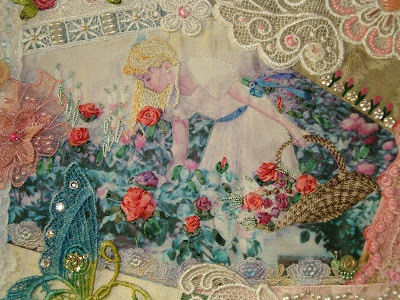 While in Ohio, I finished working on a crazy quilt round robin block for Becky...my hostess! It was kinda strange working on someone's block as they sat across the table from you...but still, I was happy with my work, and Becky loved it too. Here are some photos for you as well. First up, embellished silkies. I love to take these and over-stitch some of the areas to give it more dimension and interest. The image is printed straight from my inkjet printer, on silk fabric sheets by Jacquard. 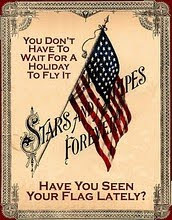 I purchase mine at www.fiberonawhim.com but am sure they are available elsewhere. The sheets come in cotton, organza, and silk...easy to use...just load them like a standard sheet of paper, hit print, peel off the paper backing and you have a beautiful printed color-fast image on fabric! Isn't technology wonderful!! My favorite part of this stitching is the basket. It came out just as I had planned. And, the little beaded snail in the bottom right corner of the image is just too cute! Here is the other little girl in the block. Her cart is filled to overflowing with flowers! Her sunshine is from a button cabochon I beaded while at Becky's...we picked out the button together while at the quilt show. It was a perfect color and that was great to share that find! And, here is the last of the embellished silkies. A branch of wisteria for this little bird. 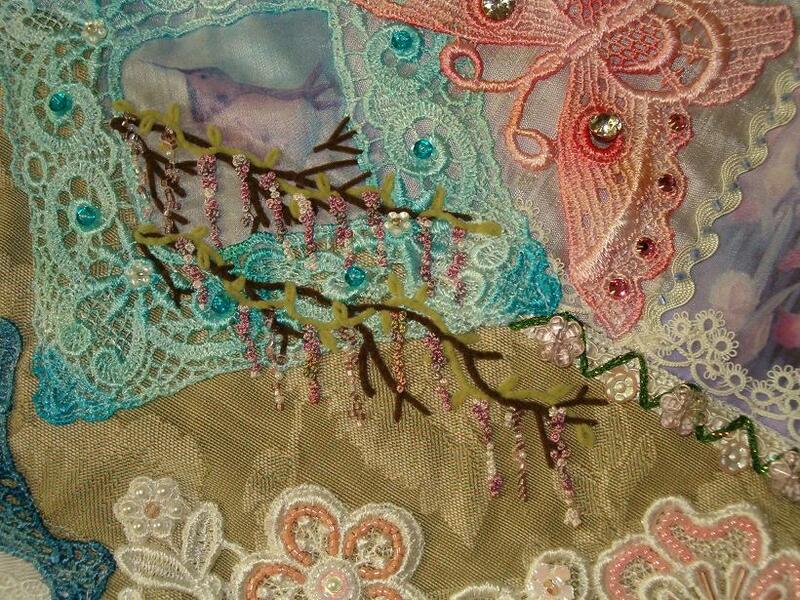 The branch and leaf vine are stitched with velvet threads, which we found while shopping at the thread store! Yeah! 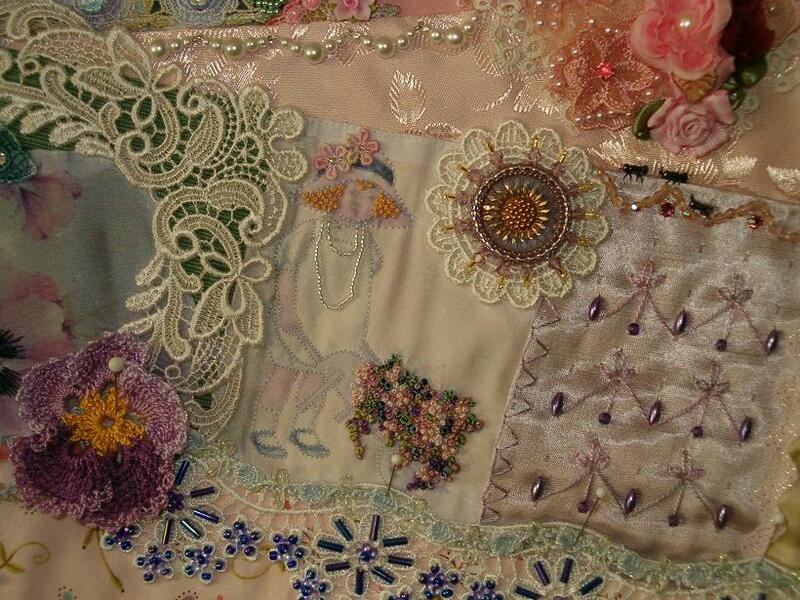 Under this image a bit of the beaded lace motif can been seen, and one of my simple beaded seam treatments to the right, along with tatted trim. These flowers are made from silk ribbon florals, plucked right off their plastic stems and pulled apart. 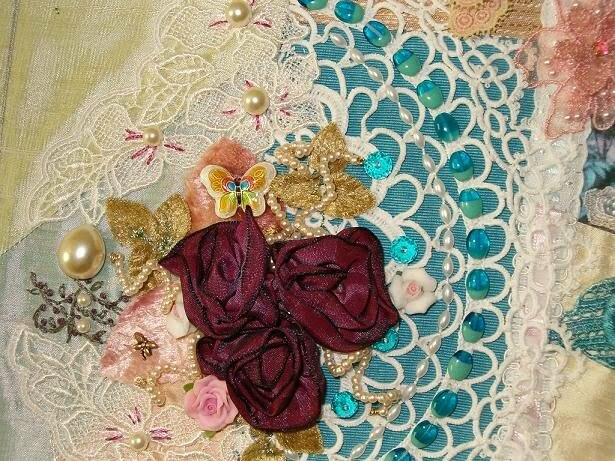 The petals are then layered and secured with a pearl stitched in the center. 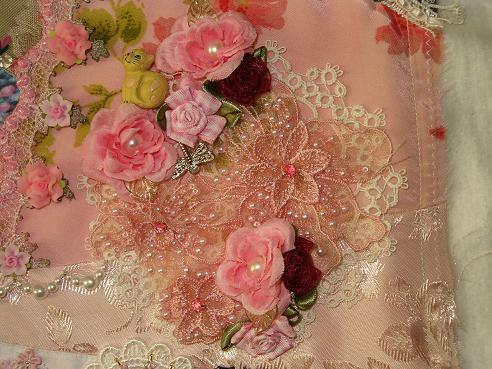 Some pink checked and wine colored ribbon roses are added to the tatted doily and peach beaded lace trim piece. I love the look of all the layers of texture. A little swag of graduated size pearls can barely been seen on the left side seam treatment; as well as the porcelain rose beads added to the pink seam treatment above them. My contribution to this area of the block was it's start of lace and tatted doily, the wired wine colored roses and velvet leaves, the porcelain roses, and the wired pearls twists. The twists were created by stringing pearls on a short piece of wire, securing the ends by bending them tightly...then twisting the entire length around a pencil to make a coil. Each is couched in place with beading thread to secure it to the block. Below the wired ribbon cluster is this spiderweb. 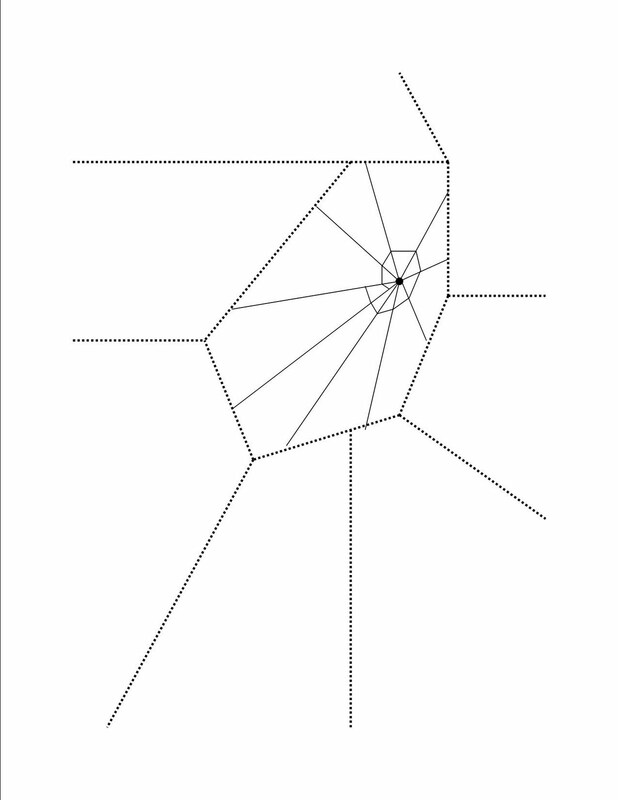 It is created just as the spiderweb tutorial (earlier post) indicated. The beaded spider is from my collection, and was purchased by Becky's sister...my friend Donna...for another of Becky's block. She graciously let me use it for this block instead. It fits perfectly witht he colors and style of this block. And, lastly...here's the button cluster placed on the block. I loved all the crystal beads and buttons. The photo does not do a good job of showing how it reflects the light. The block was really pretty when done. The other ladies working on the block, JaNae and Karen, added their own beautiful beading and silk ribbon...so the finished block was just gorgeous! And, most of all...Becky was very happy with the results. She plans to frame it and hang it in her home, which makes me smile! Spiderwebs are an absolute necessity to embroidery on a crazy quilt. 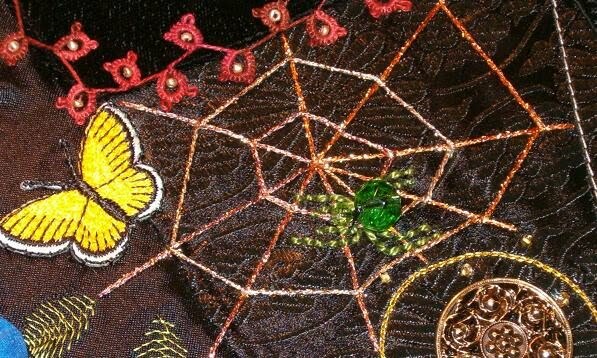 They are tied to generations of traditional belief that quilt maker and the quilt recipient will have good luck when a spiderweb is stitched into the quilt. 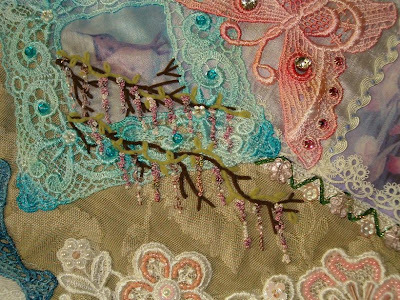 Whether or not, that is true....or even if it is believed...it is still an expected embroidery motif in crazy quilting; therefore, it is worth learning. 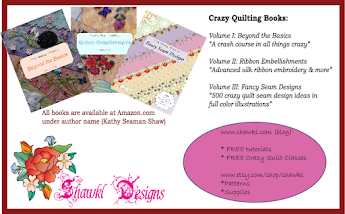 Regardless of which famed author of crazy quilt motifs you like to read...each will have at least one spider web in their arsenal of motif designs. Search on the web and you will find countless examples. So, here is my most favorite way to stitch a web. It is easy to do, and no pattern is needed. 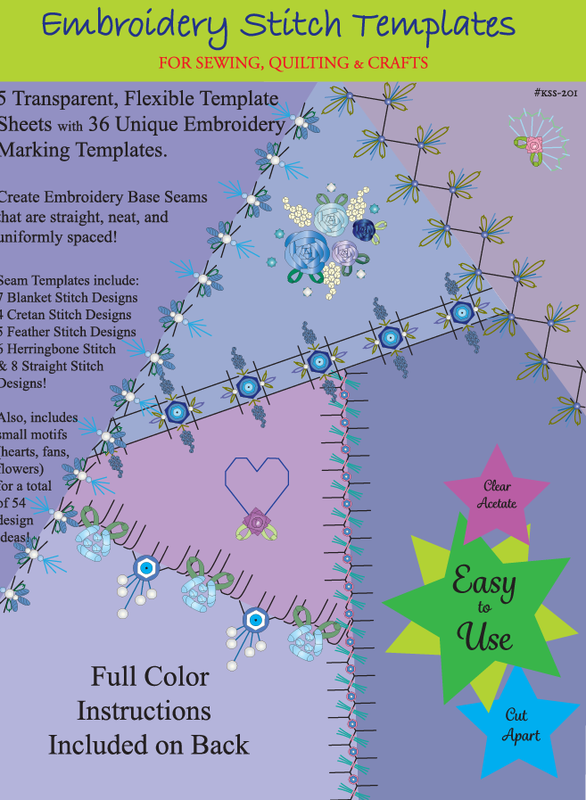 Try it and see if you like the technique...and feel free to adapt the general idea to your own style of stitching. 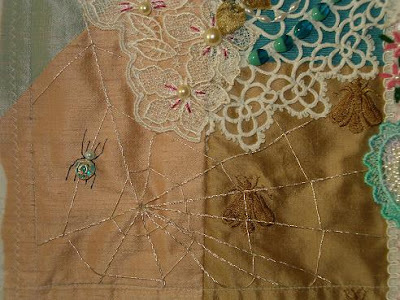 This style of web will work on any size or shape of fabric patch. So, we shall start with a patch that has lot's of sides and seams connecting to it. 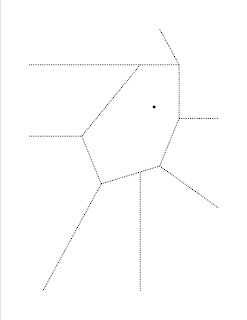 The first step is to envision where you want the center of the web to be. I normally do not make that point in the "center" of the patch, as most webs I have spent the time to observe are not perfectly circular with a center core. 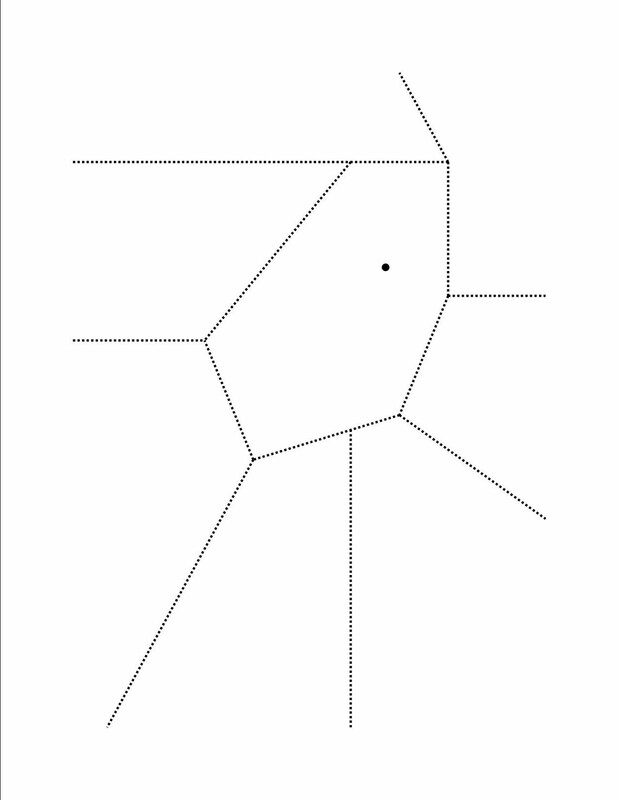 Once, you decide on a point...place a small pencil dot there as a reference point. All of your "spokes" will radiate from this point. 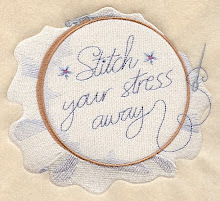 Actually, you will stitch from the outside to this point...ending all of your stitches with a "needle down" into this point. Thread your needle and needle up along one of the seams of this patch...anywhere is fine. My preference it to begin along a straight seam, and not at a corner. Needle up at this start point and needle down at the center point (the pencil dot). Repeat this process as you progress around the patch. Make the "pie wedges" different widths. Try to not start a "spoke" at a corner point. 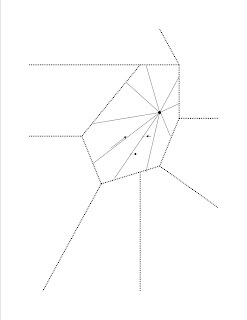 Remember to needle up at the outside edge of the web spoke, and always needle down in the center. This will make a more even center core. 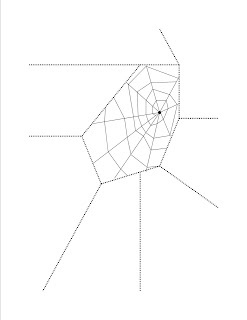 Because spider webs are naturally "anchored" to something...they don't just "appear in the sky" kind of thing...always start your spokes at a seam or at an object. These photos anchor the web only at the patch seams...but you are not limited to do just that. 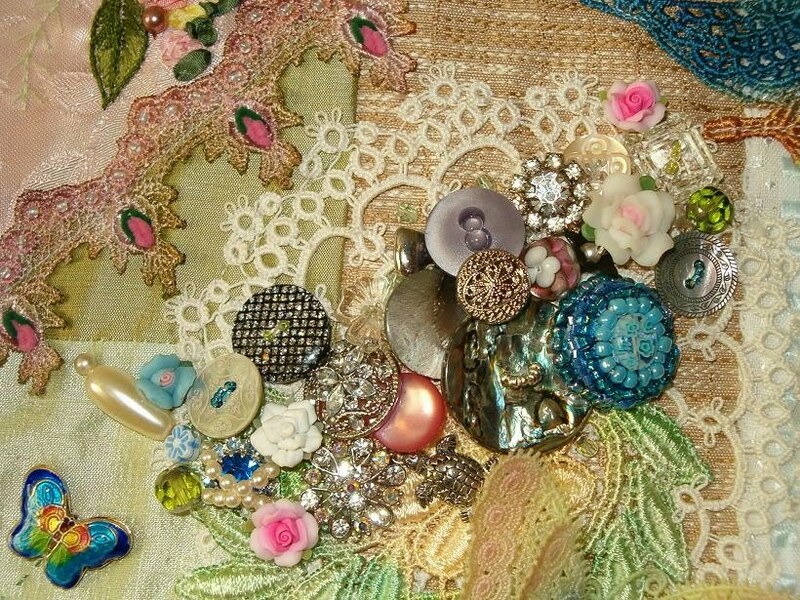 For example, if you have a silk ribbon motif, or button cluster, or an embroidery tree...if is perfectly acceptable to stitch over a patch seam to "anchor" the web to that object; rather than keep the web contained by the patch shape itself. 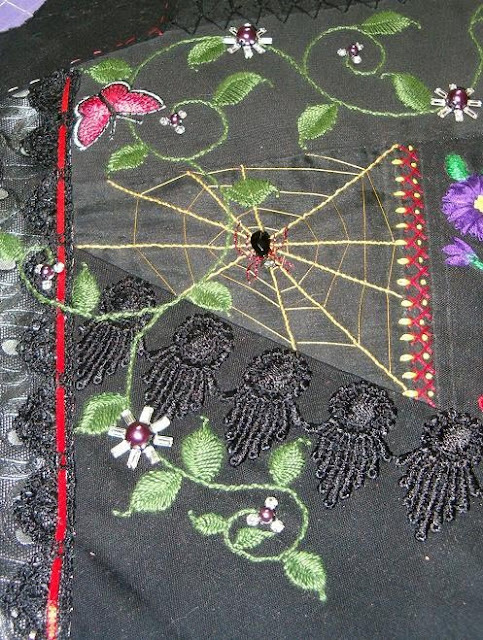 Once the spider web spokes are stitched, anchor off at the back of your work. The spokes will be couched down when the "rings" are stitched, so don't worry that they are long single stitches at this point. Thread your needle, and needleup along the side of one of the spokes...near the center of the spokes. Take your thread over to the adjacent spoke and needle down on the opposite side of that spoke. Needle up on the near side of the spoke...repeat this until you have work around the web. It is not necessary to make concentric rings on the web...like ripples on a pond when a rock is thrown in. A web can have broken rings, spiral rings, concentric rings, the sky is the limit. If you need inspiration, just search for spider web and check out all the types created in nature. Continue to work rings until the web is complete. When you can no longer make a complete "ring" around the web, start to do just partial rings. The key (in my humble opinion) to a good web is that it should not be too uniform in shape. The spokes and the rings should be different distances apart. The less uniform the design, the better I like it! 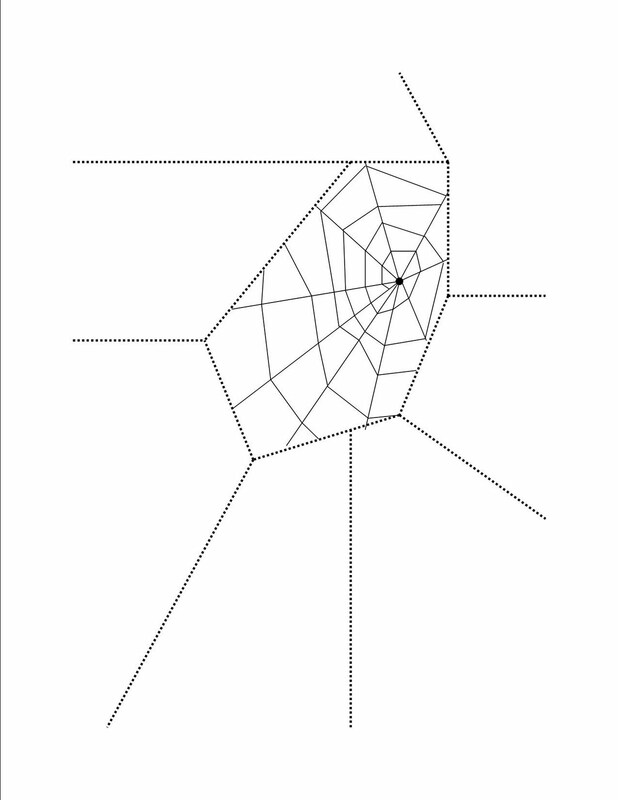 Next, we'll look at making a realistic spider to place in our web. An easy one of course!...so I'll be back with that tutorial when it is completed. Here are some webs I have stitched...and you can certainly tell they are not all alike. LOL!